Create your high quality custom photo book in three easy steps. Take time to look at the book examples and feature descriptions displayed throughout the website. Familiarize yourself with the Price My Book form so that you understand all the options available to you. Book Style - Explore all the possibile attributes and options (binding style, cover type, size, page count, etc.) that will define your book. Page Layout Concepts - Think about the type of page layout / design (classic, magazine, photo book, or custom) that suits your concept of the book. 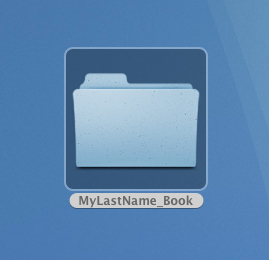 Create a folder (in a location that WILL NOT change) and name it "YourLastName_book"
Place COPIES of your images - high resolution jpegs - in the folder in the sequence in which you wish them to appear in your book. 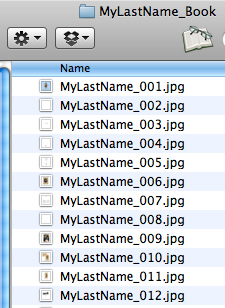 The file names should include your last name (or project name) and the suffix _001, _002, _003, and so on, for example. Select the best approach for you. We are always here to offer guidance, which ever way you select. Decide on the Design process - You can design your book using our free Design Tool book design software. Or, one of our professional designers can design your book for you... beginning at only $1.50 per page. DESIGN IT YOURSELF - with our free Design Tool book layout software application. Download our free Design Tool application to your desktop. 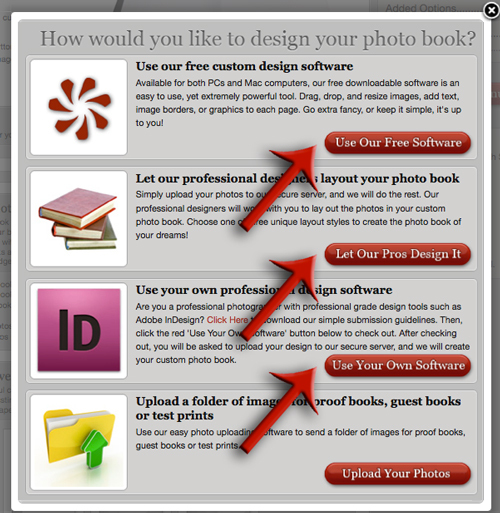 Design your book, and click on "Send to PhotoBook Press" and your project will be automatically uploaded. Click on the Upload Your Photos link on the home page of the web site. Drag your folder to the upload window, or click on the Browse button to start the upload process. If you want to do it yourself using your own professional software application, download our Submission Guidelines, and upload your completed project by clicking on the Upload Your Photos button. When the upload of your project is complete, you will be redirected to the order form, where you tell us about the details of the book you want and complete the order. Give your book project a name – “YourLastName_book” works well here, too. Complete your selections of size, binding type, cover style, end leaves, etc., and press Continue. When asked how you will design your book select the option that suits your needs. Complete the shopping cart and one of our designers will contact you to get started. You will always have a chance to review a PDF of your project before it is released to print.